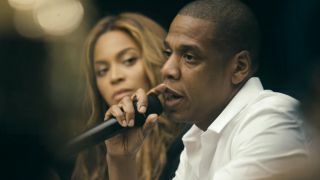 Updated: Sony CEO, Doug Morris, has moved to clear up confusion over whether Jay-Z's Tidal could lose the rights to high-def versions of Beyoncé's music. "Jay-Z is a friend and business associate for many years. I have always admired his business acumen, his entrepreneurship and his passion for music," reads Morris' statement. "All of our content, including Beyoncé, is available through the Tidal service, and we have announced no plans to remove our catalog from Tidal. Like all of our other partners, we are rooting for Jay and Tidal to succeed." So it looks like Sony is set to put a ring on those streaming rights. It's a tale as old as time: one man, caught between his wife and his wife's record label, battling for the rights to offer her back catalogue on his streaming service. According to this jazzy piece on Bloomberg, Tidal may lose a raft of artists if the company fails to reach a happy agreement with Sony, including Beyoncé's entire back catalogue - which would be particularly embarrassing since she is both a co-owner and Jay Z's wife. Poor old Tidal hasn't been the instant success that most tech services that launch with an over-the-top, self-obsessed signing of a declaration of rights by various A-Listers are - but Jay Z insists that it just needs a bit of time and a fair shake. Plus, maybe a rap or two about its competitors. There's a joke to be made here about the number of problems Jay Z has, isn't there?